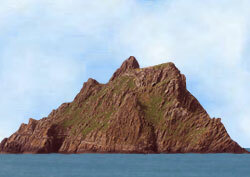 Skellig Michael in Ireland is a small, rugged, rock island dramatically rising out of the Atlantic Ocean. It lies about 20 kilometers (12 miles) from the Irish mainland. Irish monks inhabited it from the 6th to 12th century. Today, it's unpopulated, except by day-tripping tourists. It was tiny and could accommodate only about a dozen monks. To reach the site from the dock, they had to climb over 600 stone steps on a cliff path lacking safety rails. The same holds true for today's visitors. The monastic life was spartan. Monks lived in bee-hive-shaped stone huts built without mortar - and set near a precipitous cliff. These ancient dwellings are well-preserved considering their age (up to 1400 years), lack of mortar, and hostile environment (Atlantic winter gales). Small ferries leave the harbor of Portmagee from early April to late September, weather permitting. Access is limited, for conservation's sake - so be sure to make advance reservations. The boat ride takes under 50 minutes each way. You'll have two to three hours to climb up to the monastery and explore other trails.